No matter how hard we try, our Active Directory database still seems to get cluttered! The two most common obsolete objects are computers and users. Today, we are going to clean it those old objects (and provide a bit of safety in case those objects return). What we will end up with is an easy way for you to start manging inactive computers and users in Active Directory! Before we begin, make sure that you have the Quest AD cmdlets installed. If you don’t have it (or want to see the other tools I’m always using), see this link. Pretty simple right? We start off by importing our Quest Active Roles Management module. Next, we use the Get-QADComputer command to show only computers that have not logged in within a year (-inactivefor 366). So now you might be asking why am I running the Set-QADComputer command before disabling the computer? For added safety, I do not want to delete these inactive computers immediately. Instead, I want to tattoo them with the date they were disabled. We do that with this line: $Computers | Set-QADComputer -Location (Get-Date). If you use the location attribute, just change the Set-QADComputer command to another blank attribute. So after tattooing our inactive computers with a date, we then disable it and move it to an OU named Computers_Stale. You will need to modify that OU path for your environment. Finally, we need a way to delete our super stale computers (computers that have been in the stale OU for a long time). This is done by comparing today’s date with the tattooed date on the disabled computer (the date we stored in the location attribute). Right now, we permanently delete the inactive computers if they have been in the Computers_Stale OU for over 6 months (where Location -GT (Get-Date).AddMonths(-7)). And in one single command, $Computers | Remove-QADObject, we remove all of our super stale objects! PowerShell makes life simple and you no longer have to worry about inactive computers in Active Directory! 1. Replace QADComputer with QADUser to delete stale users. 2. Setup the AD Recycle Bin so that you can recover deleted AD objects. But, it is getting failed at ” Move-QADObject ” with error as bellow, any help ? No problem! Just remember that CN is used for containers (like the default Computers or Users containers). 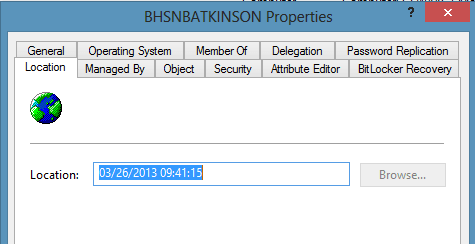 Is there an advantage to using the pwdLasSet attribute instead of the LastLogon(Timestamp) attribute? We have Macs in our environment and those are not set up (at least by default) to reset their computer password. I think the lastLogon actually shows when a user last logged on to the computer. Any thoughts? The first attribute is a bit more reliable. You can use the lastlogontimestamp with some precautions. Check out this article from the AD team at MS. I presume that if you don’t have an ARS server the Quest AD commandlets cannot be used? What is an ARS server?